So it has come to pass once again. The CWIF is over for another year and for us here at The Climbing Works it has been the most successful yet. The feedback along with the fantastic vibes from the competitors on the Saturday and the amazing crowds that came to watch on the Sunday is how we rate a good weekend and we're happy that so many people enjoyed The CWIF in 2013. - a massive thanks has to go to the routesetters who did a superb job and donated all their wages to Climbers Against Cancer (more about CAC below). - To all the competitors and the people who came to watch. 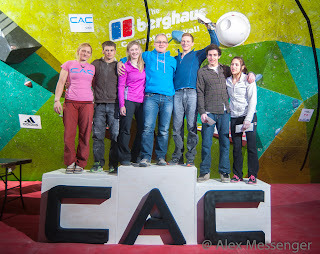 It's why The Climbing Works holds The CWIF , to get people excited about their own climbing and how far they can go. A big thanks to those who put their hand in their pockets to help raise over £6k for CAC over the weekend. - To TDC-AV Sheffield who provided the lighting for the Berghaus Competition wall and Horizon who controlled the cameras for the webcast (Massive thanks to Mike who ran the show flawlessly). - To all the sponsors, especially Adidas, Berghaus & Scarpa who provided an incredible amount of goodies and prizes for the crowds who watched. To Outdoor Research, Axis & Volx who also provided fantastic support. - To Matt Bird (Birddog productions) who provided the amazing graphics and to Adrian Samarra who stepped into Si Wadsworths big shoes to control the lighting on the Sunday (get well soon Si). - To DJ Gusenator for providing some high quality tunes throughout the day. Apologies to anyone I missed out but we are incredibly grateful for your help and support over the weekend. If you were here you know how amazing it was but if you weren't you can still re-watch the Semi's& the Finals on the IFSC Channel (or below). We'll be having a highlights film out in the next few weeks for you to enjoy also. We'll be posting a report of the whole weekend from Sam Schofield with photos from Alex Messenger later today. To wet the appetite below is a film of Jakob Schubert cruising Mens Final problem 4 to win The CWIF 2013.